A Fifth of Beethoven's jacket. 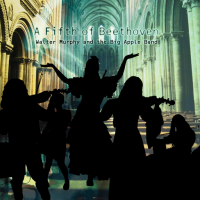 A Fifth of Beethoven is a disco arrangement of the first movement of Beethoven's Symphony No.5 in C minor, Op. 67. An arrangement by Waldeus von Dövjak appears as part of the medley Chaos Age, from pop'n music CS. Another arrangement, titled 交響曲第５番「運命」, can be found in ポップンミュージック. A remix by No.5 Orchestra, titled 運命, first appeared in jubeat plus as a preview song for jubeat Qubell. Although Walter Murphy performed almost every instrument for A Fifth of Beethoven himself, Private Stock Records felt the song would be more commercially successful if credited to a band rather than an individual. The label credited the song to the fictitious Big Apple Band, not realizing that this was already the name of an actual disco group (which later changed its name to Chic). Walter Murphy now works as a television music director and composer. He was the main music director for The Tonight Show with Johnny Carson. More recently, he has worked as a composer for animated shows including Family Guy, Channel Umptee-3, and American Dad.